On a day in which the United States celebrated a very good jobs report and the Dow Jones Industrial Average traded at its highest level since the financial crisis began, it is perhaps fitting that that we have a report for comics sales in January that doesn't make people sick. It would, in fact, be stellar — if last January hadn't been artificially depressed by Diamond Comic Distributors' change to Tuesday shipping, which resulted in many fewer items being released. Still, the figures for January are very good news, working out to around $32.75 million, by my initial estimates, which would make it the best January since 2008. Click here to see the preliminary rankings for January 2012 comics sales. The month of January has traditionally been horrible, sapping any energy built up in the previous year. But the slide from December — 6.25% in overall dollars — is the smallest that we've seen since, again, 2008, before the comics recession and the general recession began. The year-over-year increases of 33.56% in comics unit sales, 32.05% in comics dollar sales, 18.38% in graphic novel sales, 27.47% in overall dollars are great big numbers that should and will always be seen with an asterisk because of last January's issues. We sold about $7 million more in comics and trades this year partially because there were more comics and trades to sell. But we're only off less than $2 million from December, and that bodes well. 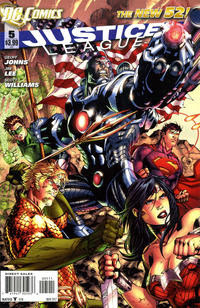 The DC relaunch effects are certainly a contributing factor; Justice League #6 led the market. The Batman: Through the Looking Glass hardcover was also a help, topping the graphic novel chart. A milder winter in many parts of the U.S. probably also helped. Marvel and DC split the market share lead this month, with Marvel leading the unit shares and DC topping the dollar share side of things. It's also interesting to look at what role cover price declines are having. The Top 100 comics had an average price of $3.35, down a quarter from last January's overall average. But the comics unit and dollar sales are correlating more closely, which suggests that the typical books sold are priced closer to the mean. So the news is good — but we won't know how good for a while. We shouldn't look to February for much comparative clarity — it's got five Wednesdays. There hasn't been one since 1984 and won't be another until 2040. I will not make a prediction about what the industry will look like then! Remember to follow Comichron on Facebook and Twitter!